Experts expose the SERIOUS THREATS and how corporations like Monsanto hide the evidence. NEVER-BEFORE-SEEN EVIDENCE points to genetically engineered foods as a major contributor to rising disease rates in the US population, especially among children. Gastrointestinal disorders, allergies, inflammatory diseases, and infertility are just some of the problems implicated in humans, pets, livestock, and lab animals that eat genetically modified soybeans and corn. Monsanto’s strong arm tactics, the FDA’s fraudulent policies, and how the USDA ignores a growing health emergency are also laid bare. 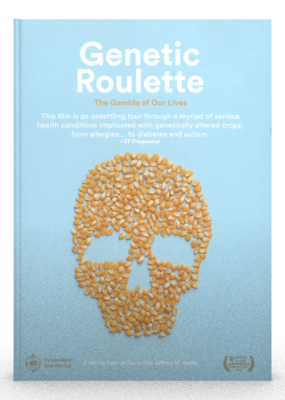 This sometimes shocking film may change your diet, protect you and your family, and accelerate the consumer tipping point against genetically modified organisms (GMOs) already underway. Don’t miss this film! The main feature film is 85 minutes. The package also contains a bonus DVD with: Seeds of Freedom (28 min) Narrated by Jeremy Irons, produced by The Gaia Foundation and African Biodiversity Network, this landmark film shows how the story of seed at the hands of multinationals has become one of loss, control, dependence and debt. The Documented Health Risks of Genetically Engineered Foods (42 min) Jeffrey Smith presents a concise, hard-hitting talk to more than 800 healthcare practitioners at Andrew Weil’s Arizona Center for Integrated Medicine conference in 2011. The Politics of GMOs (16 min) This presentation excerpt describes the unholy alliance between the US government and Monsanto, as well as some highlights of Monsanto’s dark history.